An electric kettle is so useful, you’d be hard pressed to find a home that wouldn’t benefit from it in some way. An electric kettle isn’t just for avid tea drinkers, although they will definitely benefit from one. Whether you need a kettle that will heat your water in a more efficient way, using less energy, or you need a time saver that will let you heat your water safely with just a push of a button, an electric kettle can take care of you. If you’re stuck on what type of electric kettle you need, fear not – we’ve done your homework for you. Below you’ll find all the information you’ll need to make your decision. Early in our research, we discovered the COSORI Electric Kettle and knew it was the only choice for our top pick. With its auto shut-off and the LED light that indicated when it has reached boiling temperatures and shut off, you know you’ll be in safe hands while using this electric kettle. 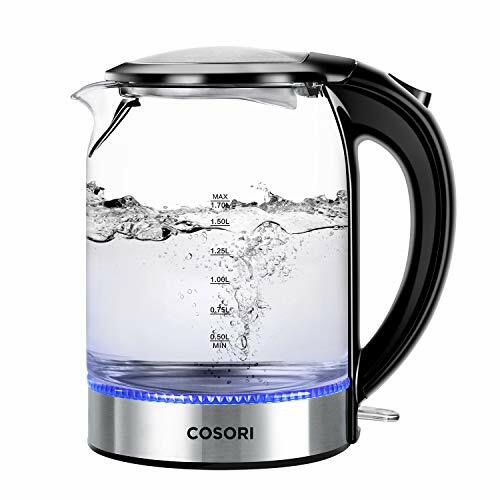 The COSORI Electric Kettle has a wide mouth so you’ll be able to both fill and clean your kettle easily. The LED light indicator allows you to determine at a glance when your kettle is in the process of boiling and when it’s shut off. And it will shut off automatically within 30 seconds of the water boiling, as well as when there is no water within – making it an incredibly safe kettle for your home. It features a filtered spout so you can use this for your tea bags and leaves (and so much more) without catching stray chunks as you drink. The glass is a high quality Borosilicate that will resist scratching and no plastic touches the water you’re boiling and the entire kettle is 100% BPA free. The kettle will lift off the base to become cordless, and when placed back on, it will rotate 360 degrees, giving you maximum flexibility. With nearly 800 customer reviews and an overall rating of 4.7 stars on Amazon, you can make this purchase with confidence. Not only is it our top choice, 92% of the people who’ve purchased it have thought highly enough to give it a glowing review. 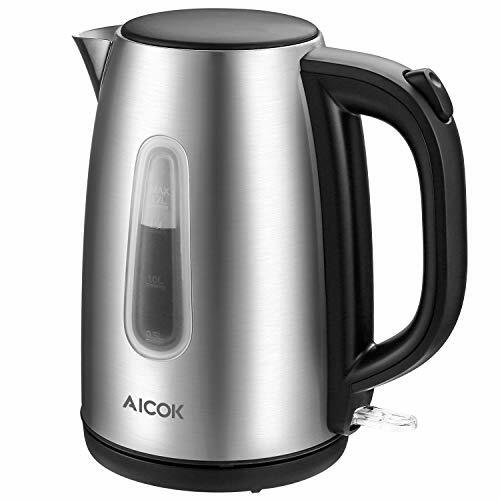 The Aicok Electric Kettle Stainless Steel Cordless Tea Kettle is made with a high quality and ultra-durable 304 stainless steel design that will ensure it lasts years to come. Of course, that may be less a concern than you think anyways, because it also comes with a two-year warranty. The auto shut-off feature will turn your kettle off promptly when it reaches a boil and the power is controlled with one simple push of a button. The stainless steel filter will make sure your drinks are pure and have no debris while the transparent water window will let you see exactly how much water you have left so you won’t ever need to wonder if you have another cup remaining. The lid will open to 75 degrees on its own and will push to a further 90 degrees, making it easy to clean, as well. There are over 500 customer reviews on Amazon for this kettle, making the rating of 4.4 stars seem all the more accurate and trustworthy. It is definitely enough to convince us it’s worth the $25 investment! The AmazonBasics Stainless Steel Electric Kettle has a concealed heating element that will prevent burns or fire hazards and the kettle itself lifts right off making it a cordless kettle that you can take to the table without fuss. The 30 inch power cord wraps under the base for a neat storage and will give the unit 1500 watts of power for a fast boil time you’re sure to appreciate. The boil dry protection will keep you from overheating and damaging your kettle if the water runs out, so that’s one less thing about which you’ll need to worry. Another safety precaution is the auto shut-off feature that turns the kettle off after the water reached boiling temperature. The filter is removable and the power is controlled with one easy-to-use button. With well over 1,500 customer reviews on Amazon earning this kettle an overall rating of 4.6 stars, we have every reason to feel safe in our recommendation. But even without the high praise from other customers, the price still makes it stand out: you can get this kettle for right around $20 – an absolute steal! 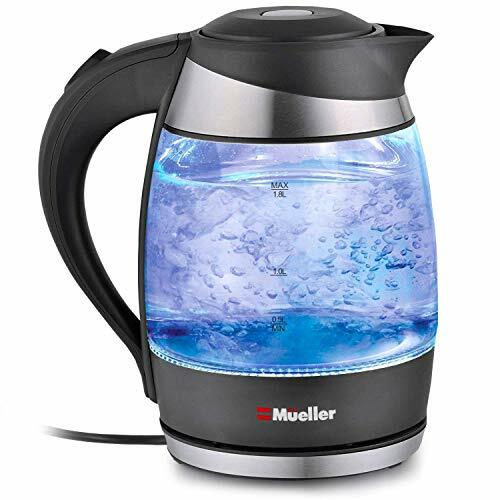 The MUELLER Electric Kettle Water Heater uses a removable filter to keep your drinks clear of debris and it, as well as the entire kettle is all 100% BPA free. This glass kettle will boil all 1.8L of water contained in under seven minutes, so you’ll be well on your way to a nice cup of tea from start to finish in ten minutes, easy. The heat resistant anti-slip handle will ensure you don’t drop this kettle as you pour – and if you’ve ever suffered the burns of boiling hot water, you’ll understand how important that is! There is also an automatic shut-off that activates within 30 seconds after reaching a full boil. The overall customer rating of this kettle is a respectable 4.2 stars with around 2,500 customer reviews on Amazon. And considering you can get it for right around $30, we think it’s a sound investment. 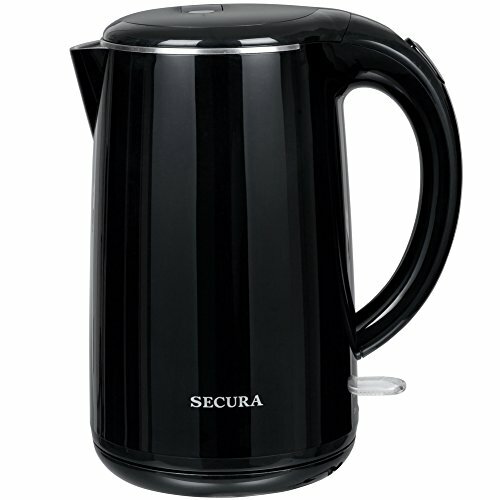 The Secura The Original Stainless Steel Double Wall Electric Water Kettle will lift from its base and become a cordless kettle you can take wherever you need it to go. It has a double wall insulation that will keep the water hot for longer and the auto shut-off will turn your unit off once it reaches boiling temperature. The lid opens with a push of a button, just as the power is operated on and off with another one-button push. The exterior of this kettle is deceiving, as it is undeniably plastic. But never fear; not only is that plastic BPA-free, the interior of the kettle is completely stainless steel. So even if the plastic were a risk (and it’s not), your water would never come in contact with it. Plus, the plastic is cool to the touch, so you won’t need to worry about it burning your hand when you lift it. This kettle has nearly 4,500 customer reviews on Amazon for an overall rating 4.3 stars – quite impressive numbers by any standard. You can pick one up for right around $35; an excellent value. If you drink tea, instant drinks or hot chocolate on a regular basis, an electric kettle is very likely a must-have for your home. The speed with which the electric kettle heats up is often times more efficient than a stove top and it is commonly accepted as the way to heat your water for superior taste. (Superior to a microwave, certainly.) Placing it in your office cubicle with a box of tea bags and a gallon of water may just save your sanity during your busy days where you just can’t seem to get away from the desk. The clean up for the electric kettle is a breeze and using it at your desk will avoid you running into your boss when you make cup after cup. Stainless steel. Stainless steel will be the most popular type of kettle on the market. Not only is it, as the name suggests, resistant to staining and therefore easier to clean, you’ll have a durable consistency. That means, for your money, you’ll be getting the kettle with the highest longevity. It will also be resistant to dents and discoloration, so keeping it for the probable decades of use won’t see you using an abused kettle, but rather one that will stand the test of time. Ceramic or glass. Ceramic kettles are, by far, the most aesthetically pleasing of all the kettles, there’s just no two ways about that. They’ll have the prints that most others don’t and just generally give a sophisticated look that you’ll love. Some argue that the way ceramic heats the water makes it taste best, but that’s definitely up to personal tastes and we doubt you’ll notice it much unless your palate is incredibly refined. Ceramic does stain easier and glass does cool faster so you’ll want to keep both of those in mind. The reviews on each of these types also seem to suggest that they’re more prone to leaking. (But you can mitigate that risk by finding the rightkettle that probably has some plastic or stainless steel touches, too.) But, of course, the best part of any glass kettle is that you’ll have eyes-on, proof when the water within has boiled, how much is left, and whether or not you have any build-up residue that you’ll need to clean away. Double wall insulated. In direct opposition to the glass kettle that doesn’t hold the heat of the boiled water for long, the double-wall insulated kettle will keep the water, not just warm but hot for hours. Along with double insulated kettles are often airtight seals which will help ensure nothing gets in to contaminate your water, making it safe to use for as long as it stays hot. This is especially helpful if you’re pairing it with a cordless feature. Hot water, wherever you need it, for hours. Cordless. Once upon a time (about 10 years ago), the only option you had for an electric kettle was to plug it in and bring your cups, or bowls to it, rather than visa versa. But gone are the days of all electric kettles being tied to the wall. You can bring your kettle where ever you need to with a cordless and while they aren’t completely cord-free, you can still move around a bit. As with anything electric, there are some cords to concern yourself with. For cordless electric kettles, you’ll have a base that will act as the heating element and you’ll be able to remove the kettle from the element once it’s reached proper temperature. Food preparation. An electric kettle isn’t just for hot drinks. You can do a lot of food prep in an electric kettle. You can boil eggs and noodles and that’s just the beginning. You can make your instant stuffing in it or instant mashed potatoes. In fact, anything that’s dehydrated like those stuffing or potato flakes can be made in the electric kettle. Steaming vegetables is another fast and easy process with the electric kettle. You can take it with you for business trips on the road and it can keep you from having to get food out every meal. Goose neck. With a goose neck spout, you’ll have a much more consistent pour so if you need your water to be controlled (for example a pour over coffee), then a kettle goose neck spout is one you’ll want to look into. The goose neck slows the pour and allows you to control the pour, making the water come out evenly so that you won’t have patches of grounds not extracted from while others have been over-saturated. Because humans aren’t perfect, the goose neck will let you compensate for any agitation you have during an accidental or careless pour. To put in terms that non-coffee connoisseurs may better understand, though: it will let you use all your grounds more thoroughly and give you a better, richer overall flavor. What is an electric kettle and how does it work? An electric kettle is a kettle (or teapot) that is powered independently by its own power source. That is, you won’t have to use a stove top or microwave. You can plug this type of kettle in and its own heating element will heat the water contained within it. 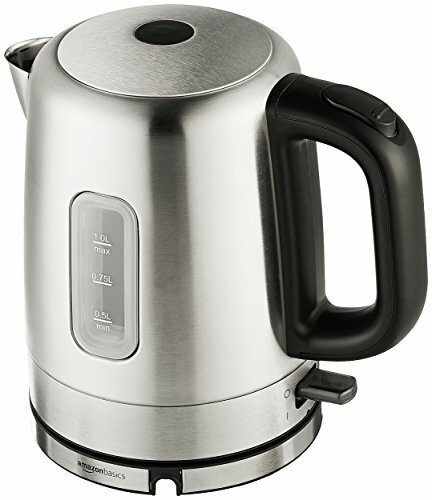 Most kettles will heat to a certain temperature or for a set duration of time before automatically shutting off. The temperature is usually to boiling (212 degrees Fahrenheit) and the duration of time is set by you. The more elaborate kettles will allow you to program more of the temperatures and duration but the most common kettles will be more similar to traditional kettles – they’ll turn on, boil, turn off. Without the stove top requirement, though, you’ll find plenty of use in your home or office outside of your kitchen. If you aren’t one for hot beverages in the mornings, check out our review of the best cold brew coffee makers. Does electric kettle kill bacteria? Boiling water makes it an inhabitable environment for microorganisms like bacteria (and also most viruses and parasites). Most electric kettles will bring the water contained within to a rolling boil before they shut off, therefore, they will kill bacteria. You will want to make sure your specific kettle is, in fact, reaching that boiling point before shutting off, though. Some electric kettles have variable or adjustable temperature points for shutting off and without boiling, the bacteria can still be present. If you’re under a boil advisory from your local water provider, it may be a good idea to give it two cycles to boil, just to be sure. Is an electric kettle safe for health? Under the right circumstances, an electric kettle is perfectly safe for your health. The right circumstances come down to the quality of the kettle, the quality of your water, and the upkeep your perform. If you have hard water (or acidic), it will be more corrosive to the kettle and repeated use will cause a build up of limescale, or calcium carbonate. Higher quality kettles will act to prevent that from occurring but you will still need to regularly clean your kettle, even when you’re just boiling water. You won’t want to let unused water stay inside the kettle; even though re-boiling it will get rid of any bacteria, the boiling has already rid the water of its oxygen and therefore the water’s taste may seem stale. Any impurities in the kettle will have leached into the water, so again, a higher quality kettle will come in handy. A stainless steel or glass kettle will be less likely to have any impurities to leach into the water, but an aluminum or copper may be a problem for stagnant water. And over time, dust particles will float into the water, and no amount of boiling will rid the water of those. Under no circumstances should you have a plastic electric kettle that will leak BPAs into your water during use. You’ll find even on glass kettles there are often pieces of the assembly that have plastic on them, but the primary concern is the interior that houses the water you’ll be consuming. A plastic exterior is fine, but even for the exterior, a BPA free kettle is best. How do you clean an electric kettle? There are a few ways to clean your electric kettle, but one of them is not to pop it in the sink and use soap and water. In fact, never submerge an electric kettle. There’s every possibility that you’ll ruin it and a pretty high chance that you won’t know you’ve ruined it until you’re suffering some consequences. If the kettle is insulated, you’ll risk ruining the seal; if its heating element is submerged you run the risk of it no longer heating properly and if you get the electric wet you run the risk of literal electrocution. It’s not necessary and it’s not safe; so stick with the other methods. You can use a 1:1 ratio of water and white vinegar and boil it. Let it stand, then pour it out, scrub away build up if need be, rinse with cold water and run through a clean water boiling cycle to complete. If the kettle suggests not using vinegar, you can use a lemon solution where you’ll squeeze the juice of a lemon into a water-filled kettle, then cut up the lemon and place the slices in as well. Boil the water and let it sit for an hour. Rinse and done. You can also mix a teaspoon of baking soda into a full kettle, bring to a boil, let sit 20 minutes, pour out then rinse with cold water. This method may be more effective for the build-up of scalding inside the kettle. If you’re not comfortable with which method you should use, don’t be afraid to check with the manufacturer. They’ll certainly know more about that specific model and make than we do. You can reference the instructions included, check out their website, or find a phone number for their customer service and just ask them directly. They may suggest a specific cleaner that is made for cleaning an electric kettle, and you will need to purchase those separately. We looked at 20 other electric kettles. Even though they didn’t make our 5 best electric kettles list, they’re the best of the rest and each is still a great option for your home. The information you’ll need to compare each one is included with the listing. This cordless ceramic electric kettle has a fully detachable base so you can take the heated kettle with you wherever you want. The goose neck spout on this electric kettle will allow you to pour consistently and controlled for any of your preferred uses. This BPA-free plastic electric kettle will boil a full capacity in six minutes or less. This electric kettle has a “Boil-Dry Protection” feature that means it will not heat when there is no water contained within, preventing overheating damage. This glass electric kettle has a soft-open lid that will slowly release steam and prevent any splashing. If you plan on using your electric kettle for tea, why not skip a step and pick this one up with a build in tea infuser? This electric tea kettle will heat your water to a boil in seven minutes or less. This high quality glass electric kettle is complimented with stainless steel, not plastic, accents. This electric kettle has a 360-degree swiveling heating element so you won’t need to struggle placing it back on its base. When not in use, you can store the multi-directional cord inside the kettle’s built-in cord storage. You won’t have to wonder about whether your water is hot with this kettle; when it’s hot, the kettle is red and when it’s cool the kettle turns back to black. This kettle has a large capacity of two full liters, making it perfect for a group or for avid tea drinkers. You can customize your temperature with the six temperature settings and the “Keep Warm” feature that will keep your water hot for as long as you want. The transparent water window will let you see exactly how full your kettle is, making sure you won’t ever be caught off guard by an empty pot. There are so many setting options on this electric kettle, you won’t have any problems finding the right temperature for your french press or your green tea. This electric kettle will work wonderfully for a french press or pour over coffee set and should you want a more traditional experience, they also sell stove top kettles from the same manufacturer along with this listing. The “Keep Warm” setting on this electric kettle will keep your water piping hot for 30 minutes. This retro electric kettle will show you the temperature of the kettle with an analogue temperature gauge. The VAVA electric kettle will just need to be registered in order to receive an extended 2.5-year warranty. The goose neck spout of this electric kettle will allow you a controlled and consistent pour that is ideal for your pour over coffee.